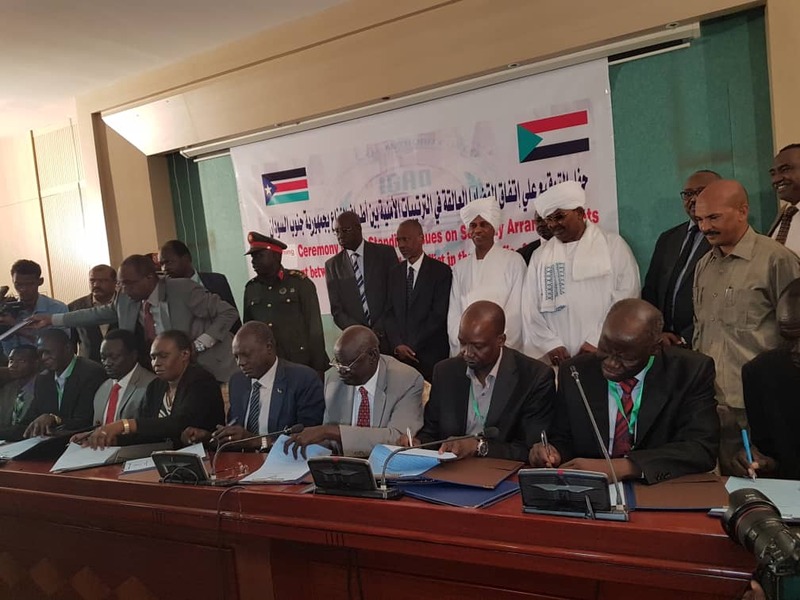 Peace partners have signed an agreement on transitional security arrangements on Friday in the Sudanese capital, Khartoum. Known as agreement on outstanding issues of security arrangements, the deal has mainly three parts. These include the permanent Ceasefire, pre-transitional period, transitional period and mechanisms of the security arrangements. Under the permanent ceasefire, the parties shall observe the Khartoum declaration signed by president Kiir and Dr. Riek Machar last month, as well as the December 2017 Cessation of Hostilities agreement. In observing this provision, they shall immediately release the prisoners of war and detainees under the supervision of the International Committee of the Red Cross, ICRC. The article also asserts that no revenge or vengeance or retribution of any kind of violation is allowed under any circumstances. While implementing the ceasefire, the agreement states that free movement of South Sudanese citizens, Commodities and services shall be guaranteed by the parties and humanitarian corridors for relief shall be immediately opened. The agreement also outlines activities the parties are obliged to undertake within eight months of a pre-transitional period once the implementation officially commences. These include immediate demilitarization of civilian areas such as schools, service centers, occupied houses, IDP camps, villages, churches, mosques and livelihood areas, among others. Secondly, disengagement and separation for forces and collection of long and medium-ranged heavy weapons. Thirdly, they shall canton and assemble their forces inaccessible areas at the present barracks and sites under the supervision of the current monitoring bodies of 2015 peace deal. The third part which is on transitional period states that all collective heavy and medium-range weapons shall be disposed of and shall be determined by a joint Defense Board. Under this arrangement, throughout the period, training of personnel selective for the military, police, security, and program of Disarmament Demobilization and Re-integration shall continue for personnel. On this, the parties shall build a national army, police, security and other forces that shall be completed and deployed throughout the country at the end of a three-year transitional period. On mechanisms of implementing the security arrangements, the parties shall form a joint Defense Board to jointly exercise command and control of all the forces. Furthermore, the peace parties shall form a joint technical security committee that shall constitute half of the members from the Transitional Government of National Unity and the half from the opposition groups collectively. Eight of the members shall be from TGoNU and five from SPLA-IO and the three others shall come from the other opposition groups. According to the agreement also, a joint military ceasefire commission shall be formed at national, state, county, Payam, and Boma levels. Finally, the current ceasefire monitor- CTSAAM shall be restructured and reconstituted to be known as Ceasefire Transitional Security Arrangement Monitoring and Verification Mechanism-CTSAM-VM which shall be led by Uganda and Sudan.